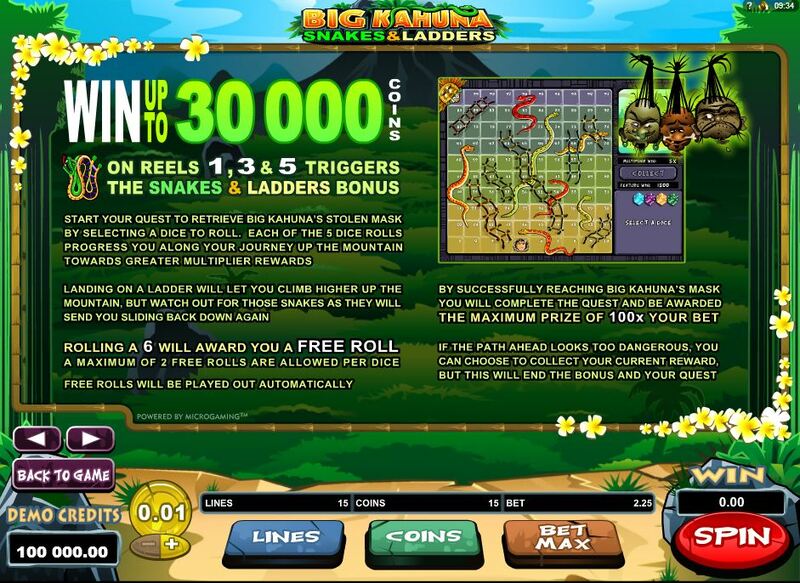 Big Kahuna will give you a tribal and jungle themed slot machine, the Snakes and Ladders part being about a bonus game which is available in it, but without a direct connection to the rest of the design. It’s a cartoon style game from Microgaming, with beautiful symbols and characters, more than enough details built into them and overall feeling like a game which is worthy of your attention. 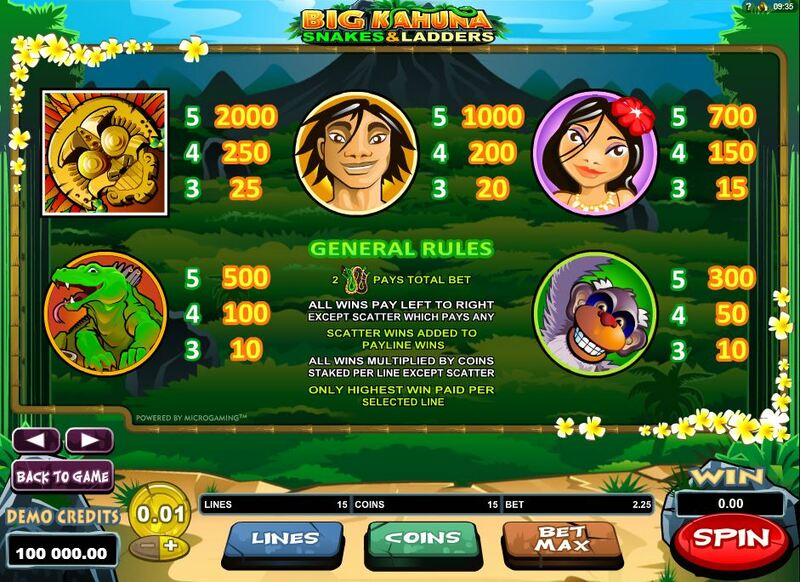 With 5 reels and with 15 bet lines on them, The Big Kahuna also comes with payouts of $25,000 and with a mix of bonus games, scatters, free spins, multipliers and wilds. 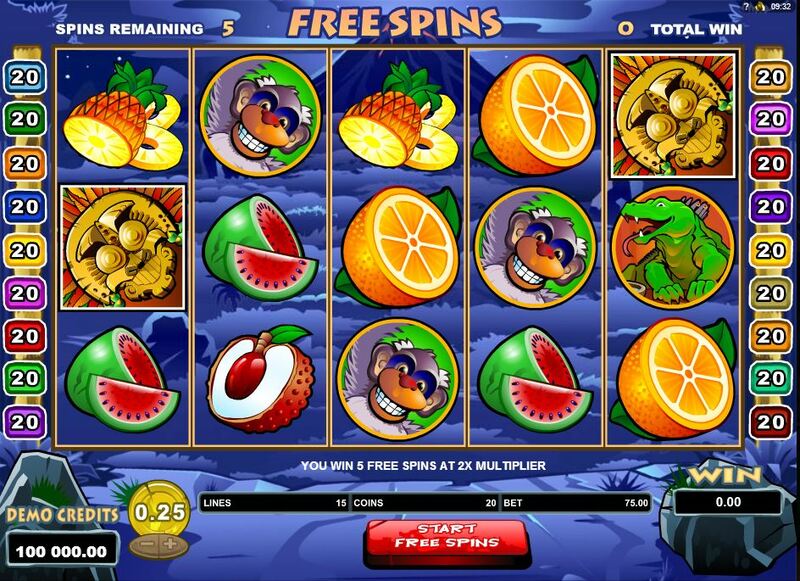 The game’s features are the ones you’re probably wondering about, so you will be happy to hear that you get a little bit of everything in it, like the wilds which apply multipliers, the free spins which also improve prizes, scatters and bonus games. 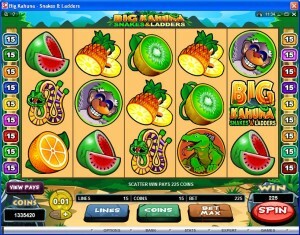 The Big Kahuna Logo will serve as the wild of the slot machine, capable of forming combinations directly, or contributing to others doing the same. When wilds don’t appear from left to right with at least three symbols on the same line, they try to be part of combinations formed by other icons, being substitutes for whatever icons are missing there. Wild symbols double prizes when they do this, applying a 2x multiplier. However, if they do manage to create their own combo, you can expect payouts of up to 5,000x, which would mean the slot’s top jackpot. 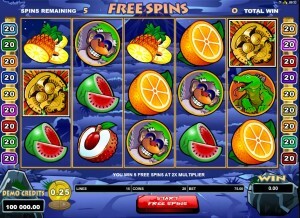 The free spins don’t ask anything of you to get started. They will simply be triggered at random, as you play the game. 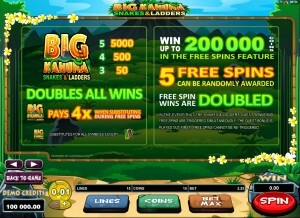 You get 5 free spins from this feature, with a 2x multiplier. 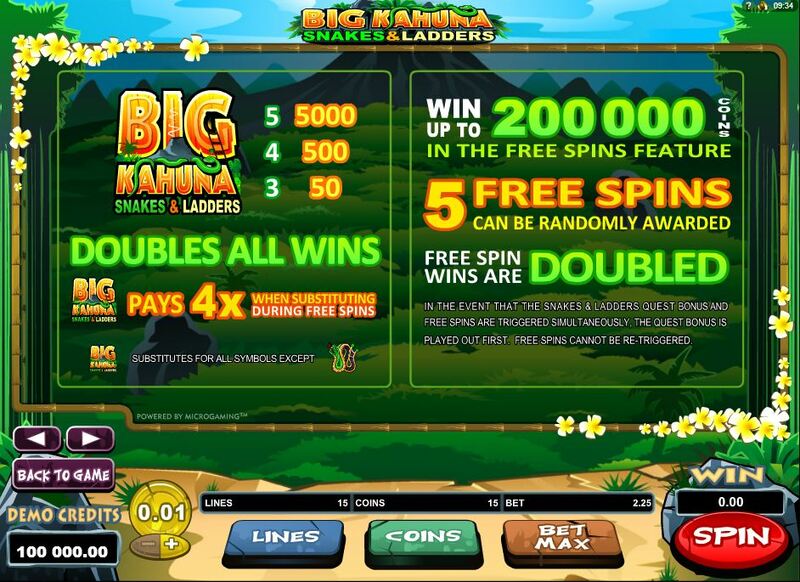 Wilds offer 4x multipliers during the free spins, by combining the feature’s 2x feature with its own, also at 2x. The Snake scatter appears on these three reels: 1, 3 and 5. 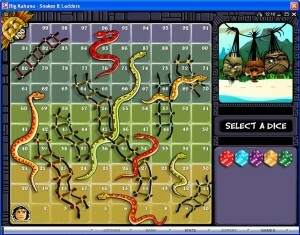 Getting the Snake on all three reels will signal the start of a bonus game, called Snakes & Ladders. 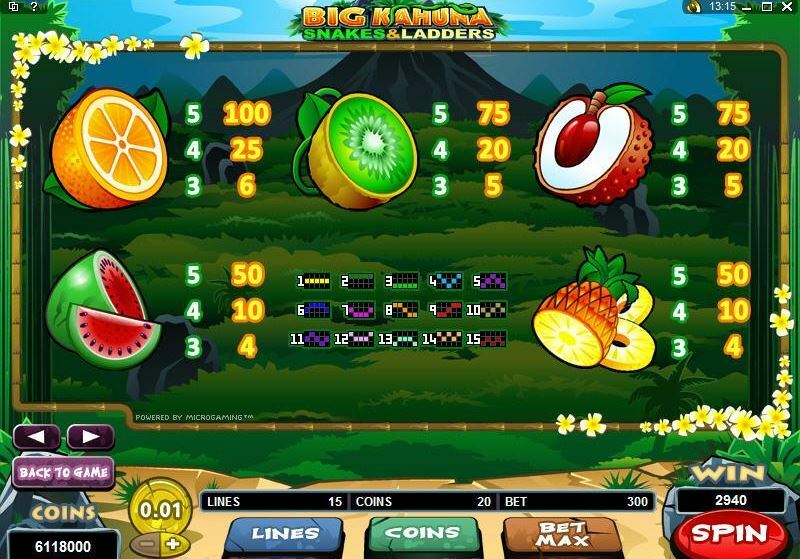 You have to retrieve the mask of Big Kahuna and you do this with the help of dice rolls, which tell you how much you will advance on the board. A total of 5 dice rolls are available to you. 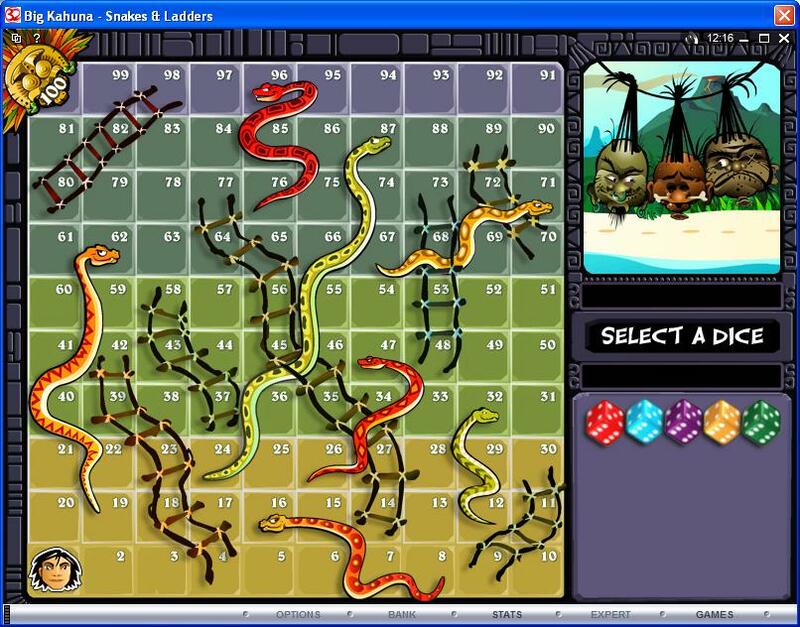 The ladders which appear on the board will let you climb higher, but there are snakes as well along the way, so you risk finding one of those if you play it for a longer period of time. Snakes will make you slide back. 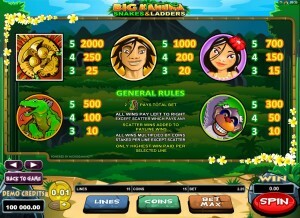 If you get to the Big Kahuna Mask, you ge a prize worth 100 times the bet. 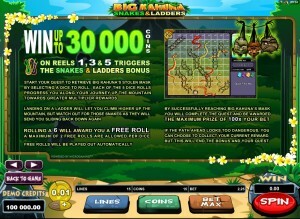 The game offers you the option to collect your winnings, if you decide that the path ahead is too dangerous. You can get a free roll when you roll a 6. Up to 2 free rolls can be obtained from each dice. You get to use a lot of coins in the wager, up to 300, but the actual value will only go up to $75. Each coin has a maximum denomination of $0.25 and you can select as many as 20 for one line. 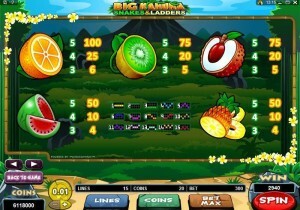 The line bet’s maximum value is $5. Even though the jackpot offers you up to 100,000 coins, that’s a 5,000x line bet multiple, valued at $25,000. The symbols all look jungle themed, and that’s the case for both the fruits and the tribe members and animals that are part of the paytable. There are no playing cards here, which is a good thing. The design is colorful and clean, simple enough without becoming boring. It’s not the best design you will ever see, not even close, but you’re going to have no problem spending some quality time on it. Symbols: Game Logo (5,000x, wild), Snake (scatter, 2x the bet), Idol (2,000x), Man (1,000x), Woman (700x), Komodo Dragon (500x), Monkey (300x), Orange (100x), Kiwi (75x), Red Fruit (75x), Melon (50x) and Pineapple (50x). It’s not an extraordinary game, but it’s a perfectly usable title, which should give you a few hours of fun and maybe some prizes in the five figure range as well. 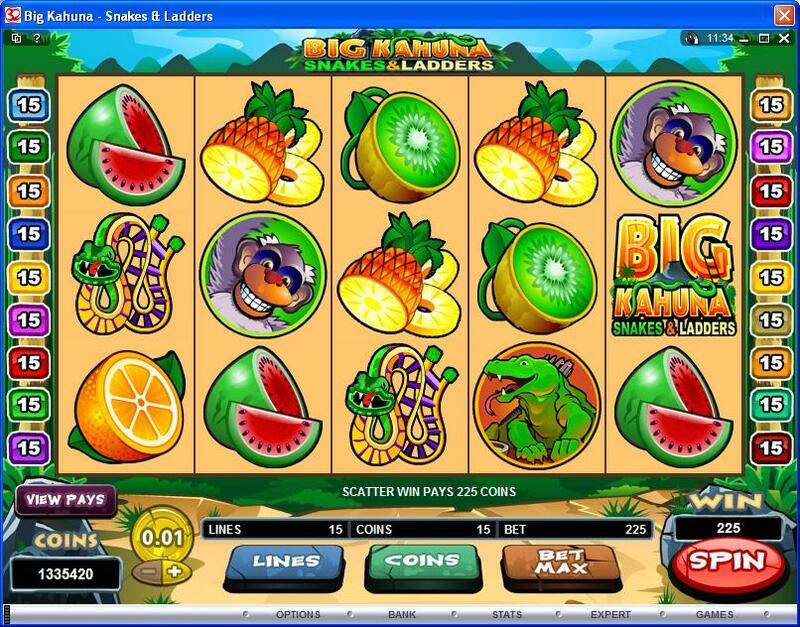 The The Big Kahuna Snakes and Ladders slot machine is offered through the Microgaming platform, so if you want to play it for real or just to practice, look out for casinos that use it.